This picture and caption are from a tattered 1939 copy of "More about the Four Little Kittens" by Pennsylvanian Harry Whittier Frees. On the dedication page, Frees notes: "These unusual photographs of real kitten were made possible only patient, unfailing kindness on the part of the photographer at all times." Wow! 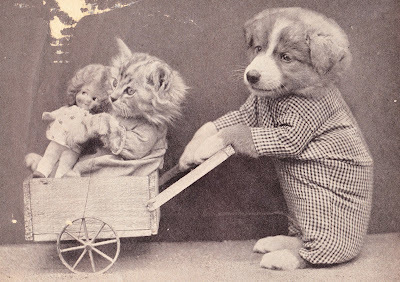 There was an old photobook at my grandmother's house that featured real photos like this (but with puppies). It makes me wonder if it was the same author or if it was just a trend at some point. I wish that I had it because it was adorable.